When it comes to coding shoulder and knee procedures, it's best if coders remain agile and bone up on their anatomy. Both inpatient and outpatient coders face particular challenges when coding various joint procedures. These procedures can be complicated to code accurately, which can lead to errors with significant consequences. Dianna Foley, RHIA, CCS, CHPS, coding education coordinator for the Ohio Health Information Management Association, believes many of the errors stem from coders having a poor understanding of joint anatomy. "Anatomy is the area that presents the most challenges, especially if the coders are new and/or haven't done those procedures before," she explains. "Shoulders and knees are different." "The shoulder is much more difficult than the other joints," says Heather Greene, MBA, RHIA, CPC, CPMA, an AHIMA-approved ICD-10-CM/PCS trainer. "You can run into problems with open vs closed procedures. The surgeon may have started with a closed procedure, and it has to be converted to open. Something like that can be difficult for the physicians to document and for the coders to pick up." Lisa Baris, RHIT, CCS,CCDS, director of HIM at Nuance, says inpatient coders may find it difficult to code shoulder procedures because of the area's complex anatomy. "There are often other procedures done at the same time as, say, a shoulder replacement. It's difficult then for inpatient coders to discern what is integral to that type of replacement—the bursa, the ligament, and biceps tendons—that they do procedures on. If it's integral to the replacement, you're not supposed to code it, but if it's not, you are," she says. Lisa Knowles, RHIT, CCS, compliance, education, and privacy officer for Harmony Healthcare, believes knee procedures have taken on greater complexity because of changes enacted by the Centers for Medicare & Medicaid Services (CMS). "In general, if you think about joint procedures, it will be harder for outpatient coders this year because CMS took knee procedures off the inpatient list," she says. "In the past, if you had an inpatient person with no comorbidities, then it could be done as an outpatient procedure, but CMS wouldn't pay. That has changed. For outpatient coders, it's a whole new world. Now they have to learn those CPT codes. They may have been coding for commercial payers but not CMS, which is brand new, only since January 1." Because of this change, outpatient coders are seeing a large increase in these procedures. However, the procedures are not allowed to be performed in standalone ambulatory surgery centers; they must be performed within the hospital setting but on an outpatient basis. Despite the changes, however, some patients can still be treated as inpatients. "The coder needs to be aware of this possibility," says Alpha II coding manager Cynthia Keith, CPC. "The surgeon would have to indicate why the person would be required for two or more midnights of postoperative care. For example, is it a comorbidity or high-risk issue? In order to use Part A skilled nursing care after the surgery, the patient would have to have a third midnight indicated, for instance. Even for that person to be considered inpatient, but he or she had to return home prior to skilled nursing care, that individual would still have to be documented to account for that extra time." Carol Aspros, RN, BSN, ACM, IDDP, director of clinical content at Alpha II, adds, "The patient would have to be admitted to inpatient status not for observation because that does not qualify you for skilled nursing. However, if you go home after an inpatient stay, you can still be qualified for rehab." "Under certain circumstances, it may be necessary to indicate that a procedure or service was distinct or independent from other non-E/M [evaluation and management] services performed on the same day. Modifier 59 is used to identify procedures/services, other than E/M services, that are not normally reported together, but are appropriate under the circumstances. Documentation must support a different session, different procedure or surgery, different site or organ system, separate incision/excision, separate lesion, or separate injury (or area of injury in extensive injuries) not ordinarily encountered or performed on the same day by the same individual." "The fact that the AAOS [American Academy of Orthopaedic Surgeons] and the AMA [American Medical Association] differ from the NCCI edits presents a challenge for outpatient coders," Keith says. "The NCCI edits note the shoulder as one joint. The AAOS and AMA recognize the joint in different parts. For example, a surgeon performs a rotator cuff procedure and a debridement. The surgeon will code it in one way. The NCCI edit bundles codes 29822 and 29827, but the other guidelines do not." Keith offers another illustration: "A surgeon performs a procedure on the left shoulder and an extensive debridement on the right shoulder. Code 29823 on the right shoulder, and then add RT modifier with a 59 modifier. They may want to bypass modifier 59 or the subset of modifier 59, but I would recommend not attempting to do so." Another issue is physician documentation. Baris says surgeons will document in their own terminology, making it difficult to translate that "language" into coder terminology. "You want the surgeon to document as detailed as possible but it still takes analysis on the part of the coder to discern which ICD-PCS root operation applies to the surgical procedure," she says. Foley believes the complicated nature of coding joint procedures affects inpatient and outpatient coders equally. "If you're solely an inpatient or outpatient coder, you're going to focus on the things that are relevant to you. Each type of coding presents its own challenges," she says. Because the amount of information both inpatient and outpatient coders must know is vast, it's important for them to have references available. "Resources and education are both important," Greene says. "I advise coders to get the education they need to keep up with the changes, particularly because of ICD-10. I have been in this field for a number of years. I have never seen such an emphasis on the Coding Clinic, which has always been there for us. We see it in the workplace and when we network. We're sending information back and forth and asking one another what we're each doing with that information. With ICD-10, we have to think about things differently." Keith believes having two sets of guidelines may account for why accurately coding joint procedures can be elusive. "Additionally, some carriers will accept modifier 59 and still let you use it. Then there is the education side of it. The guidelines don't disagree but it's also knowing who considers what anatomical site as separate and who considers it to be the same—also what carriers approve it," she says. "You have to have an outstanding knowledge of anatomy and you have to know the terminology that you're using. In the NCCI edits, you'll hear standards of medical surgical practice a lot, and you have to have the documentation to match." The importance of a thorough understanding of anatomy can't be undersold, Aspros says. "In the knee, there are compartments. You have to code using the furthest anatomical site. That will make a difference in how you code," she says. With inpatient coding, it can be challenging for coders to know which root operation to apply. "We're still trying to get up to speed with ICD-10," Foley says. "What does the physician mean to do when he goes in there? One example is a dislocated patella that can be corrected with a lateral retinacular release. However, coders must look at the intent of the procedure to accurately arrive at the correct root operation. In this case, 'reposition' would be the appropriate root operation instead of 'release.'" Greene and Baris concur with Foley in that the root operation can be the most difficult to determine. "Determining the correct root operation has to be the biggest challenge," Baris says. "The anatomy of the shoulder is tough, so you want great anatomy resources available to you, and then understanding which root operation applies and what is integral to the specific procedure." "Root operations can trick people," Greene explains. "Excision is the cutting off or out of a portion of the body without replacement. Resection is cutting out entirely without replacing the body part. The physician may not say which it is. The coder has to know the correct root operation. There are a number of root operations and you have to know all of them." Likewise, coders need to know whether a procedure is a supplement or a replacement. When the physician inserts a biologic or synthetic material that reinforces or augments the function of a portion of a body part it's considered a "supplement." On the other hand, "replacement" means that the biological or synthetic material is going to physically take the place and/or function of all or a portion of a body part. "Coders have to take complex cases that are difficult to read and dictate, and they have to filter that down into numbers," Greene says. "They have to distill that information, and that is tricky sometimes." With outpatient procedures, whether a procedure is arthroscopic or open makes a difference. "For instance, 29875 is the code for a limited synovectomy, plica excision," Foley says. "Can you code it in addition to 29881, which is a meniscectomy? The short answer is no; the rationale behind it is bigger. The plica excision is listed in the CPT manual as a separate procedure, meaning that it is considered part of more extensive procedures and should not be coded additionally. This is reiterated in NCCI edits as well as the CPT Assistant, a necessary resource for outpatient coders. Unbundling can be problematic, and the coders need to know where to go for resources. Those resources can help coders decipher whether or not to apply a modifier." Knowles says shoulders take the honor for being the most difficult joint to code. "The shoulder has so much going on. The simplest one to code is the hip; the next one is the knee, and the most difficult is the shoulder. We don't have any other joint in the body that has the mobility around it—the ligaments, tendons, cartilage, the rotator cuff—the shoulder is by far the most challenging. Coders have to be spot on." Poor coding can lead to denials, potentially affecting reimbursement. It may be an indicator of fraud and abuse, leading to audits. "One of the most obvious consequences is denial," Foley says. "When that happens, somebody has to go back and review to see if the code has been assigned correctly or if it warrants a modifier to bypass an NCCI edit for payment. If not, you will have to give back the reimbursement. Coding quality is very important. We want our coders to code accurately. If there is improper coding too often, then it can trigger an organizational audit. You're also opening yourself up to looking at a broader cross-section of records, over and above the original area of concern." "On the inpatient side, there is always the chance that you'll end up in the wrong DRG [diagnosis-related group], which can impact severity and reimbursement," Baris says. "You can very easily get to an incorrect DRG, so you want to be sure you have mechanisms in place to catch those situations. It's a very complex coding system. For example, if you are going to change out a liner after joint replacement and use the root operation of revision rather than supplement, it would result in a lower-weighted DRG assignment, reflecting a lower reimbursement and lower patient severity. There are a lot of different mechanisms that can be put into place such as second level reviews and/or postcoding automated flags, which can assist in catching any cases deemed to be high risk for coding errors." According to Knowles, who says denials are on the uptick for both facilities and physicians, the results of inaccurate coding touch every segment along the health care continuum. "It affects the practice, the facility, and the patient," she says. "One of the things I always tell the team members is 'What you assign affects the patient.' The last thing a patient gets from the facility is the bill." Greene cites how inaccurate coding can deter efficient patient care. "What we code follows the patient for the rest of their lives. That really bothers coders. We don't want to hurt somebody or put someone in a situation that will make their lives difficult, saying they had something, for instance, that they haven't had. It's important that they make sure to code properly," she says. Addressing coding problems involves knowing where to look, Keith says. "The organization has to identify where the risks are to alleviate them," she notes. "CMS encourages other carriers to review pre and post based on modifier 59. We ask coders and providers to review their claims the same way, prior to and postpayment. We recommend making a table for the most used joint procedures and most billed carriers. They can track the patterns and trends and also can call the carriers if necessary." Organizations should review and validate local coverage determinations and national coverage determinations before submitting claims, Aspros says. "Hospitals and carriers have to be aware of information—the decision to operate, would physical therapy be necessary, and certain parameters must be met. Carriers need to make a decision based on that," she says. Looking at the long game, accurate coding has far-reaching effects. "It's data—it helps drive data for population health," Knowles says. 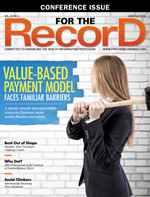 "Coding is used for so many things as we move forward for reimbursement. Coding now has so much more depth because of data analytics. Correct coding assignment has never been more critical: population health, patient safety indicators, quality outcomes, patient reimbursement, and the patient. We need to always remember that it's about the patient," she says. The Office of Inspector General (OIG) has been observing organizations that receive cardiac device credits and fail to reimburse Medicare/Medicaid. It's likely the OIG will do the same for joint replacement credits. "According to FDA, recalls of medical devices nearly doubled from 2003 through 2012. CMS [Centers for Medicare & Medicaid Services] has expressed concerns about the cost of replacement devices, including ancillary cost, on Medicare payments for inpatient and outpatient services. We will review Medicare claims to identify the costs to Medicare resulting from additional use of medical services associated with defective or recalled medical devices. "Certain medical devices are implanted during inpatient and outpatient procedures. These devices may require replacement because of defects, recalls, mechanical complication, and other issues. Federal regulations require reductions in Medicare payments for the replacement of implanted devices due to recalls or failures (42 CFR §§ 412.89 and 419.45). "Prior OIG reviews have determined that Medicare Administrative Contractors made improper payments to hospitals for inpatient and outpatient claims for replaced medical devices. We will determine whether Medicare payments for replaced medical devices were made in accordance with Medicare requirements." When hospitals deal with manufacturer credits, it impacts a number of areas, making it difficult to create a comprehensive bill, according to Carol Aspros, RN, BSN, ACM, IDDP, director of clinical content at Alpha II. "In order to send a device back, there are multiple people responsible to get the information gathered," she says. "Every manufacturer has different criteria and forms, and it's a multistep process to get reimbursement back from Medicare. Medicare requires that specific modifiers be added to the procedure code. There are many factors to consider when a device is recalled, including paperwork, regulations, and risks associated with that recall for the patient and the facility to consider."